We live in a high-tech world. A few keystrokes in North America can affect what a person in Australia sees on their computer screen. Human voices can be sent to the other side of the planet in a matter of seconds. Our favourite music and shows can be broadcast to thousands of people who can watch them without leaving the comfort and convenience of their own homes. We are so used to having light, sound and information available to us at the touch of a button that we often forget about the technology that goes into bringing it to us. Much of that technology involves cable assemblies, and Meridian Cable is here to help customize the perfect cable assembly for you. Not all cable conductors are the same, and this is one area where size matters a great deal. Meridian Cable does not expect you to make do with a sub-optimal conductor size, and we allow for flexibility in your custom cable assembly by offering the ability to extrude wiring starting at 34 gauge and ending at a large 12 gauge. Freshly made wire has a tendency to all look the same. Even for a seasoned electrician or communications worker, this can make working with custom cable assemblies a lot harder than it needs to be. Meridian Cable offers a wide variety of colours with which to differentiate between all of the strands and wires. Not only does this eliminate the time wasted guessing which strand is which, it decreases the safety hazards that occur when mistakes are made. Even small amounts of electricity can be terribly dangerous, especially in an out of the way place where sparks will not be noticed right away. Meridian Cable’s high quality insulation works as the first line of defence for you and for your cable assembly. We offer further protection and improved functionality with fillers made from a variety of high quality materials such as cotton, Kevlar and PVC. Finally, we wrap the finished product in a tough and flexible jacket to keep everything together and protected from the degrading influence of the outside air. Your cable assembly will work best if it is fully customized according to which kinds of cables are optimal for your needs. Meridian Cable has a large number of different cable types for you to review before making your final choice. They can be used as-is or serve as the starting point for a more complex customized assembly. Our goal is to give you the freedom to create the perfect cable assembly for your needs. … don’t forget to check out Meridian Cable’s related products to help you create a high quality finished project. 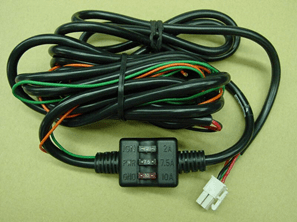 We offer coil cords, molded plastic components and custom designed wire harnesses. We have been in this business for over 25 years and we are here to help! ← What is an Electrical Cable Assembly?